I will be honest, staying at a hotel is not my favorite when traveling with a young toddler. I’d book a house through Home Away or Airbnb, so that we have the luxuries of home. This is ideal for making meals, having somewhere to retreat to after bedtime and did I mention more space?! However, we stay at hotels because they fit our budget. After countless nights of hotel stays we have picked up a few tricks and want to share them with you. This page does contain affiliate links. The ultimate question of staying at a hotel with a toddler is where are they going to sleep?! If your child is like mine, you can’t be seen during bedtime or its game over. This brings out a whole new level of creativity and skills that you never knew you had. My first piece of advice is see if you can get a suite with a separate living space. Yes, it is more money, but if you can swing it then it is worth every penny. That way the toddler in one area and parents and older children are in the other. Always ask for the upgrade, because the worst they can say is ‘no’. If there is no upgrade available, ask for a room at the end of the hall. It is quieter and will have less foot traffic to potentially wake your angel. so that she can’t see us if she should stir. We have put her in the hallway, used curtains to make a room and placed her in secluded corner. If the bathroom or closet is big enough, consider that as an option. I have included a few photos from our most recent trips. If none of these work make sure you bring a monitor, lay them down and leave the room. We have spent many a night in the hotel hallway right outside our door. Just don’t forget to take the room key with you! Be sure to bring a good sound machine with you as well. We can’t recommend this enough. It helps drown out those people who are overly loud and arriving in the wee hours of the night. 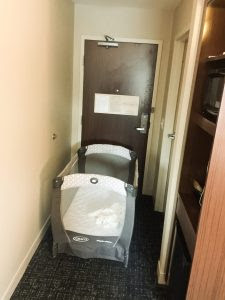 Most hotels and some Airbnb actually have cribs and pack-n-plays that they can put in your room upon your arrival. This means no hauling that huge piece of luggage around. Bring your own crib sheets as they don’t usually provide them. We had to get real crafty one evening and utilized the curtains to make a room. Note that the HVAC unit was not by the window, which allowed us to do this. We secured the sheers and ensure that our little one couldn’t grab the curtains from her crib. This worked like a charm! This multi-tasker is under utilized for the traveling parent. Let’s start with the bags. These are great to stuff poopy diapers in so your hotel room doesn’t smell like a Diaper Genie. They are also handy for dirty clothes, to keep snacks in, a puke bag and a mini trash bag. We have used the bucket for storage, as a “refrigerator” and a toy. Mandatory when traveling is blue painters tape. This multi-purpose gift from God can cover outlets, sharp corners, be use to help tie back curtains and so much more. We have used it to shut curtains for a black out effect. You can even use it to secure drawers and cabinets. It is unbelievable all the things I have used painters tape for during my travels, besides things for the baby. Labeling, suitcase repair and lint roller are just a few. Ensure that you get on your hands and knees and look around the hotel room. I have always found a coin or two on the floor that has been left behind. These little choking hazards and more are almost always found by your toddler if you don’t get to them first. In the event your hotel does not have a fridge do not panic. Call the front desk and see if they can place one in your rooms. Many hotels have them for diabetics and for mothers who need a place to store their milk. If the hotel doesn’t have anything available then go to the nearest store and buy a little lunchbox cooler. Then fill those bags from the ice bucket with ice, tie them off and throw them in the cooler. Voila! Instant fridge. Utilize the ice bucket to keep things cold until you can find another solution. Traveling and toddler meal time seem to always occur at the same time and never at a convenient time. Breakfast can be especially challenging. Easy tip: book a hotel that has a complimentary, preferably hot, breakfast. The ability to run down and grab a plate of food and bring it back to the room is invaluable. We set up our portable high chair and put down our plastic mat to keep food from getting on the floor. This allows our little one to eat breakfast while the rest of our party gets dressed for the day. No mat? Ask for extra towels and use one under the chair. When booking our hotel we almost always book through TripAdvisor. The honest reviews will tell you everything you need to know about a hotel and whether or not it will be a good fit for your family. We always look for a hotel with a pool, since our little one loves to swim and makes for the perfect rainy afternoon activity. When booking consider how far the hotel is away from desirable attractions, restaurants and local parks. You don’t want to spend your whole vacation in the car getting from place to place. Need a changing station? The desk is the ideal location to set up all your diapering needs. We always ask for a room with a tub, if possible. This makes bath time significantly easier! Bring a tub toy to keep your little one distracted. Don’t forget to use the plastic drinking cups or water cups to help during rinsing. Make sure you have a sick kit ready in the event a member of your party falls ill.
Don’t be discouraged if the sandman doesn’t come right away or as you’re used to. Many toddlers have difficultly falling asleep in new surroundings. Bring books and small toys that will keep them entertained during the time you spend in the hotel room. A quiet book, little people and animal figurines are a few of our favorites. Happy Travels and may you get a few hours of sleep! Looking for more tips on traveling with a toddler? Look no further!